Basic Law Enforcement Officer Education – provides entry-level training for prospective and newly hired officers throughout our region. Specialized Law Enforcement Training Program - provides training for certified law enforcement officers in specialized and advanced subjects critical to modern law enforcement. Defensive and Tactical Driver Training Program - offers instruction in the operation of all types of vehicles for government, corporate and civilian drivers. While attending the Basic Law Enforcement Officer Education, the attendees can earn college credits toward an Associate of Applied Science degree in Public Safety. The Walters State Basic Law Enforcement Officer Education is an intensive nine week, 494 hour course of instruction on basic law enforcement. 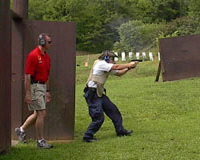 Upon completion of the academy the student will be awarded the Technical Certificate in Basic Law Enforcement Officer Education and is eligible to apply for certification by the Tennessee Peace Officers Standards and Training (POST) Commission as a certified peace officer in the state of Tennessee after being employed by a law enforcement agency. Academy students are required to live at the academy Sunday night through Friday afternoon. During the academy the average day for a student starts at 5:30 AM and does not end until 10:30 PM Monday through Friday. Technical Certificate in Public Safety - Basic Law Enforcement Officer EducationTwenty-three semester hours of college credit will be granted to each student successfully completing the Basic Law Enforcement Officer Education. Application and acceptance to the Basic Law Enforcement Officer Education is a separate process and must be completed in addition to the WSCC Application. For a complete academy information packet, visit the apply now page located here and follow all instructions. After reviewing the information packet, if you still have questions please feel free to call 423.798.7990 or423.798.7950 to speak to a member of the academy staff. The successful recruit should come to the academy with and average-to-above average academic ability, similar to the typical college freshman. The successful recruit will start the academy in sufficient physical condition. 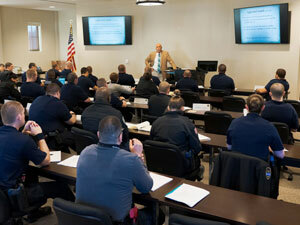 The Division of Public Safety offers specialized Law Enforcement schools each year, serving upper east Tennessee Law Enforcement Agencies. The courses offered are coordinated with the respective agencies in order to fulfill their training needs. A detailed list of courses which includes complete descriptions of each class. To register, contact Amanda Hill at 423.798.7946. 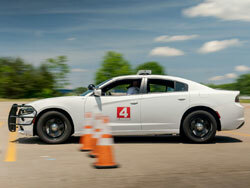 Walters State Community College is recognized as the leader in driver training throughout East Tennessee. Each year, our driver training facility is utilized to train approximately 1,000 civilian and government drivers in the safe operation of motorcycles, police cars, school busses and fire rescue vehicles. The driver training facility is located at the Public Safety Center less than one mile from WSCC's main campus in Morristown, TN. This enables us to set up a variety of course configurations and accommodate almost any type of vehicle. Provides for continuous on-track student/instructor communications. and videotaping of practical exercises may be performed as needed. Our driver improvement programs are approved by the Tennessee POST Commission and recommended by the State's leading government insurance provider, the Tennessee Municipal League. Our instructors are certified by the National Safety Council, the American Automobile Association, the Federal Law Enforcement Training Center, and other accredited driving programs. This course is presented as an entry-level class in the Regional Law Enforcement Academy and as a re-certification or refresher class in the Specialized Law Enforcement Training Program. This course prepares current full-time officers to instruct at the basic academy or specialized training level. 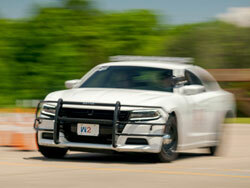 This course expands beyond the basic Defensive and Tactical Driving class to include pursuit intervention strategies such as the Precision Immobilization Technique and Box-In Maneuver as well as the use of spike strips, aviation support and other resources. If you have a classroom and a suitable area for practical driving exercises (large parking lot, air strip or similar paved surface of at least 2-3 acres), we can bring a Defensive and Tactical Driving course to your site. Many agencies take advantage of this option which reduces overall training expense in terms of man-hours lost, as well as travel and lodging.